In the very beginning of this series, we created a simple module whose job was to add a single page. In this video, we do the same thing so we have a page where we can safely add any output we need from our examples. So, what we were in the middle of doing when we took this sidetrack to talk about PSR-4 and hook menu is we wanted to add a page to our module. So, first we need a route to define the path that will render our page, and second we need a controller to build the content of the page. We're going to start with the controller. So, if we jump back to our resource pack directory, what we'll do is copy the eleventh step which is blindd8. controller. php controller for example page. We'll copy this and paste it inside of our blind d8 folder and rename it to blindd8. controller. php. Let's open this up to take a look. This controller is about as simple as it gets. Now, it might look like a lot of code for what it does, but it's basically boilerplate. It's something that you'll most likely copy and paste or use a template for every time you create one. 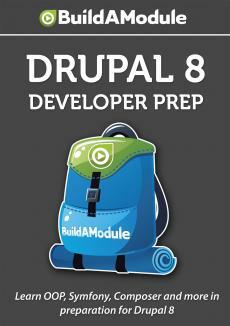 We're defining the name space as Drupal slash blind d8 slash controller. So, that's the name of the module slash controller. We're going to use the controller base class which is in the Drupal core controller name space. Our controller is going to be a class that extends the controller base, and then we'll have a function that returns the output. Now, this output can be a string, or it can be a render array. We've talked about render arrays in the Drupal 7 series, and render arrays in Drupal 8 are very similar. We're setting up the render array with a single item which is markup, and that will be rendered just as plain HTML and in it we're passing some text. So, normally if we have some text that we need translated, we would use the T function in Drupal 7, but in Drupal 8 we're going to use this T instead. We're not going to get deep into where this comes from, but this is the standard. If you look across the code base in Drupal 8, we can see numerous examples of this. Okay. So, now we have our controller, and just in case you're coming into this midway, we've talked a lot about controllers throughout this series, what their role is, how to use them in both Symfony and early on in this series we talked about controllers in the context of Drupal. But the controller is basically an intermediary between raw data and the way that we view that data ultimately. In this case we're not doing anything very complicated, but this structure allows for a more predictable approach to connecting up data with output. Okay. So, now we have a controller. In order to get this controller to return a value for a page, we need to define a route which basically defines the existence of a page and tells us where we can find the content for that page. So, let's jump to our resource pack directory to grab that route. It's going to be the twelfth step which is blindd8. routing.